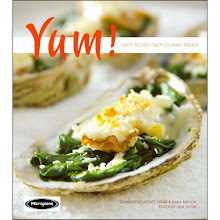 Eat Your Books is a clever idea, an on-line cookbook, magazine and recipe blogger indexing system. Rather than going to all your cookbook indexes looking for a cream brûlée, brisket or paella recipe you just go on line to Eat Your Books and type. You are allowed to add a total of five (cookbooks, magazines or on line original recipe blogs) to your personal library for FREE. Of course, who stops at just five but there is a fee, not a very expensive fee of $2.50 per month or $25 for the year. If you are a cookbook junkie, this seems a good place to be with others like yourself – I’m easily at 300 cookbooks plus.